FISA renewal: Report suggests spy law allows mass surveillance of European citizens. 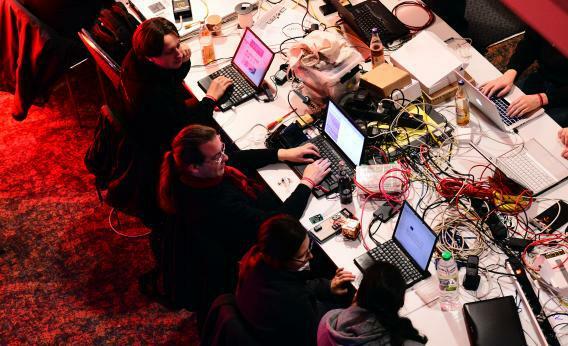 Participants work at their laptops at the annual Chaos Computer Club computer hackers’ congress in Hamburg, Germany. They probably would not be pleased with FISA. That’s according to a new report produced for the European Parliament, which has warned that a U.S. spy law renewed late last year authorizes “purely political surveillance on foreigners’ data” if it is stored using U.S. cloud services like those provided by Google, Microsoft and Facebook. According to Bowden, the 2008 FISA amendment created a power of “mass surveillance” specifically targeted at the data of non-U.S. persons located outside America, which applies to cloud computing. This means that U.S. companies with a presence in the EU can be compelled under a secret surveillance order, issued by a secret court, to hand over data on Europeans. Because non-American citizens outside the United States have been deemed by the court not to fall under the search and seizure protections of the Fourth Amendment, it opens the door to an unprecedented kind of snooping. “It’s like putting a mind control drug in the water supply, which only affects non-Americans,” says Bowden. The lack of attention European data protection authorities have paid to this provision has been “shocking,” Bowden adds. But with FISA’s renewal and the release of the report, that could be about to change. Most countries’ spy agencies routinely monitor real-time communications like emails and phone calls of groups under suspicion on national security grounds. However, what makes FISA different is that it explicitly authorizes the targeting of real-time communications and dormant cloud data linked to “foreign-based political organizations”—not just suspected terrorists or foreign government agents. Bowden says FISA is effectively “a carte blanche for anything that furthers U.S. foreign policy interests” and legalizes the monitoring of European journalists, activists, and politicians who are engaged in any issue in which the United States has a stake. FISA, according to Bowden, expressly makes it lawful for the United States to do “continuous mass-surveillance of ordinary lawful democratic political activities,” and could even go as far as to force U.S. cloud providers like Google to provide a live “wiretap” of European users’ data. U.S. officials, perhaps unsurprisingly, have continually rejected claims of mass snooping on Europeans. In a speech last year, William Kennard, U.S. ambassador to the European Union, addressed what he called the “fear of unlimited U.S. government access to data,” saying that all law enforcement and national security investigations in the United States are subject to legal and judicial constraints designed to protect individual privacy. It’s certainly questionable whether a U.S. court, even in secret, would be audacious enough to actually authorize mass spying on European journalists, even if it is a theoretical possibility. But in Europe, serious skepticism remains. Not satisfied with assurances from U.S. officials, Bowden and co.’s report calls for EU citizens to receive “prominent warnings” that their data could be vulnerable to U.S. political surveillance. The report also proposes that Europeans be granted equal protection in American courts. Now, though, it seems inevitable that Europe’s policymakers will eventually have to face up to questions over U.S. snooping, no matter how controversial. The latest report uses words like “heavy-calibre mass surveillance fire-power aimed at the cloud”—the kind of language that can’t be brushed under the carpet for long.